New research says just how addictive smoking is for you depends on the color of your skin, and reveals the link between nicotine and melanin. Smoking is especially bad for people with dark, melanin-rich skin. Inhaling thousands of chemicals is not a good idea. But it is especially bad for people with dark, melanin-rich skin. That’s because melanin grabs and hangs onto the nicotine. Dr. Gary King from Pennsylvania State University studied nicotine — the highly addictive stimulant that makes people crave cigarettes — and melanin, a compound your body makes that determines how dark you are. And he found a connection. According to Dr. King, the melanin is strongly attracted to nicotine, and the way it works is when you light up a cigarette, the tobacco and all the chemicals created when it burns into your mouth, into your lungs and the rest of your organs, including your biggest organ … skin. Greater dependence means it’s much harder for darker skinned people to kick the habit. 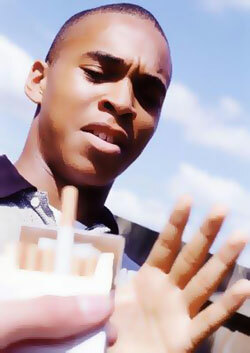 In fact white smokers on average are 15 percent better at quitting than blacks. Even though whites typically smoke about five more cigarettes a day. Can smoking make skin darker?